The only kind of bite associated with Halloween is normally from Dracula. We don't usually think about our pets biting anyone or anything, except for a favorite shoe from time to time. Halloween's sights and sounds are unlike any other time of the year. People come in and out of homes in scary costumes. There are a lot of loud voices, doorbells, and commotion. Frightening decorations are everywhere, some with strobe lights or artificial fog. Because there is so much going on, dogs can react in ways they never have before. That's why it's important to know what you can do to prevent dog bites and deal with injuries. Secure the dog safely behind a closed door or in a crate away from the front door. Close blinds or drapes so the dog doesn't see people coming and going through the window. Give the dog a chew bone or other toy. Watch for trick-or-treaters so they don't have to ring your doorbell or knock if you have a dog that barks at those sounds. Keep all pets inside, even if you have a fence. 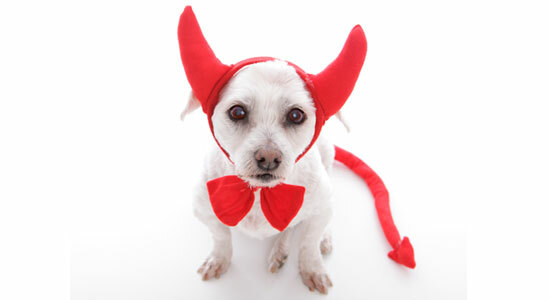 Avoid trick-or-treating at houses where a dog is tied in the backyard or barking behind a fence. If an owner opens the door and there's a dog, stay where you are. Let the owner know if you feel uncomfortable around the dog and wait for them to move the dog away from the door. Never approach any dog, even if it's one you know. If you're in costume, it may not recognize you. Stay where you are – don't run, wave your arms, or jump. Remember: Even the nicest of dogs can have bad days that can cause them to react negatively. The best way to prevent dog bites is education. Take a look at our dog bite safety resources so you can be prepared on Halloween or any other day.